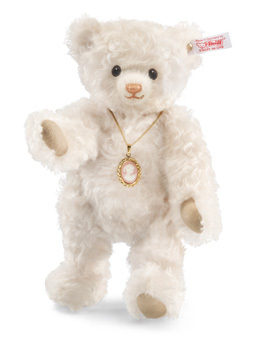 Steiff Carlotta Teddy Bear Discounts Apply ! Made from the finest quality Smokey White Mohair. Carlotta Teddy bear is sure to be a favourite with the monarchy in her smoky white mohair coat. Around her neck she proudly wears a genuine cameo medallion based on a historical design. Carlottas nose is hand stitched from light caramel floss with pink undertones. Her glossy black eyes shine brightly. Shes ready for an audience with the royal family and to take her place in your collection. Jointed, safety eyes and stuffed with synthetic filling material, and with gold-plated "Button in Ear". and Surface Washable.